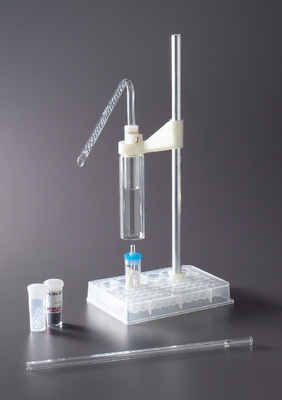 The Combo-Still™ offers an opportunity to demonstrate or teach organic chemistry in a new and inexpensive way. The inner glass vial contains the reactants and the outer glass vial is filled with silicone oil and is used as a heating bath. Very little heat is needed, and only 2-4 mL of reactant is necessary. Ordering information: The apparatus includes an organic-resistant microplate, experiment stand, thermometer, two glass-bead packed columns (one for reflux, the other for distillation) and a vial of boiling chips. An instruction manual is also included.